Online shopping and new technology has changed how customers interact with brands and make purchases, and it has had a huge effect on the customer experience. Knowing who your customer is and what they expect from your company is huge, especially when it comes to understanding why customers shop online. How customer experience is put into action changes based on the type of company and industry and what customers need to best have their needs met. 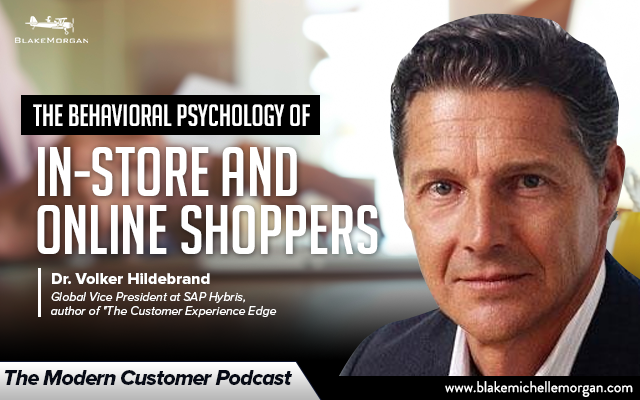 However, there are always core similarities; Dr. Volker Hildebrand, Global Vice President at SAP Hybris and author of “The Customer Experience Edge”, has narrowed customer experience down to four fundamental principles: convenience, speed, relevance, and reliability. Companies that have the best customer experiences do a great job with at least three of the pillars. Customer experience is a holistic experience, and being able to offer a personalized approach for each customer can give your company a big advantage over the competition. Although companies may have internal silos, customers don’t see that and want a cohesive experience. Volker cites the example of a bank that was having difficulty getting customers to sign up for online banking. When it realized employees in the branches didn’t have any incentive to refer customers online and that the two entities were being run separately, it made changes to unite the branch and online experience and combine the metrics. Customers don’t care about what’s going on behind the scenes as long as they can have a quality and convenient experience, so companies need to take down silos for a unified experience. The internet has made the customer journey start way before the customer actually buys a product or steps into the store. Now, customers are doing their research to find out what products are best, and they expect to be able to find all the answers they need quickly and easily. If a company can’t provide those answers, either through a chatbot, online community, or human, they risk losing that customer to a brand that can provide the answers. Thinking about things from the customer’s perspective and making sure all the information is accurate and easily available can start the customer experience off on the right foot. One disruptive aspect of online shopping that is changing business models is subscription services. These days, customers can have subscriptions for everything from rental cars to toilet paper. Subscription models offer customers the convenience of not having to worry about ordering something, and they often come with discounts. However, using a subscription model means customer experience is more important than ever. In these cases, the experience and service is really what makes the difference—you’re no longer selling a product, you’re providing a service. Making customer experience an integral part of everything the company does, especially online, can drive growth and customer satisfaction. The key to customer experience is finding a way to stand out and put yourself in the customer’s shoes to provide a cohesive experience from end to end, no matter if it is online or in store.